A promising young man has lost the battle after he reportedly drank a dry gin laced with Tramadol. A young Nigerian man has reportedly lost his life after taking a mixture of dry gin and tramadol. According to Instablog, the middle-aged man identified as Chibuike aka Achi reportedly died on Thursday in Okomoko, Rivers State. The incident happened on Thursday evening. The deceased had loaded himself with the drink before heading to a bakery in the area, to beat another young man whom he had accused of snatching his girlfriend. He was heading home after successfully beating his rival, when he collapsed and died. When his pockets were searched, a bottle of dry gin, tramadol, lighter and a penknife were found. His rival and the snatched girlfriend have since been arrested by the police. 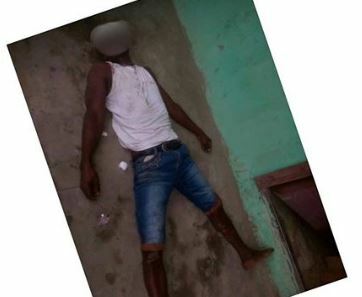 0 Response to "Man Dies After Taking Tramadol-Laced Dry Gin In Rivers State (Photo)"